2015 has been really good to me. It was truly one of the best years of my life! I’ll admit I prayed. I asked God for 2015 to bring me happiness, adventure and love. He definitely delivered! Me! Non-practicing-Catholic-sarcastic-but-I-still-love-my-grandma-ME! I prayed and it happened. I truly feel it was the year I discovered a new layer of awesomeness about myself and those around me, made peace with what I’ve experienced in the past and found new goals to crush in the future. I am so grateful for what I have right in this moment. Can I just list what made my year? My cousin Tricia is finally pregnant…with TWINS! I cried when I found out. Okay, there’s just too much to list. Sure, there have been many disappointments, failures, and hardships this year, but you know when your blessings outweigh the negative. I’m truly happy. Happy. That word makes me nervous! I’ve always kinda been a Negative Nancy, pointing out that happiness doesn’t truly last forever, someone is always there to wait for you to fail and steal your thunder, but who cares? We owe it to ourselves to thank God for this moment and appreciate all that we have. 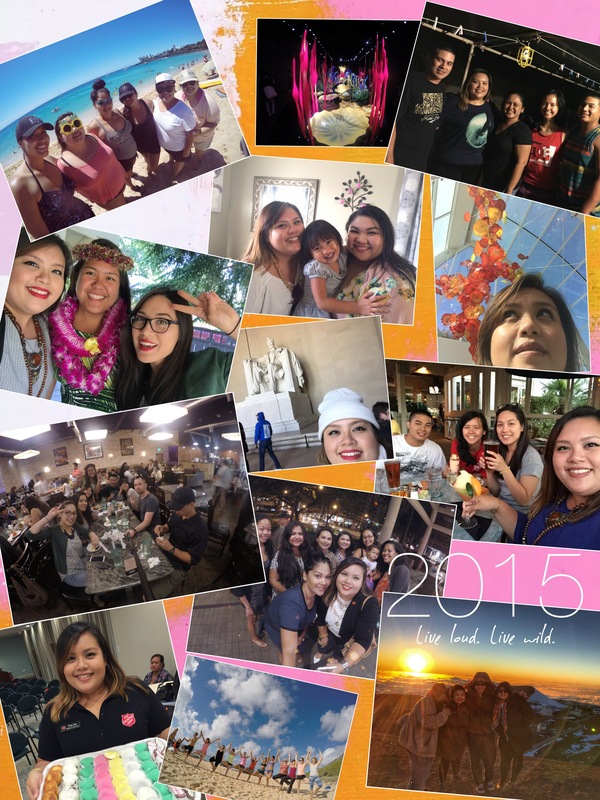 As you can tell, 2015 has changed the way I perceive situations, relationships and the world around me. One of the catalysts in this transformation is…well…I work with some of the most faithful, humble and selfless people. I have to admit that even their faith and grace towards others and myself may have rubbed off. It can’t be helped. They’re a blessing and I learn from them every single day. 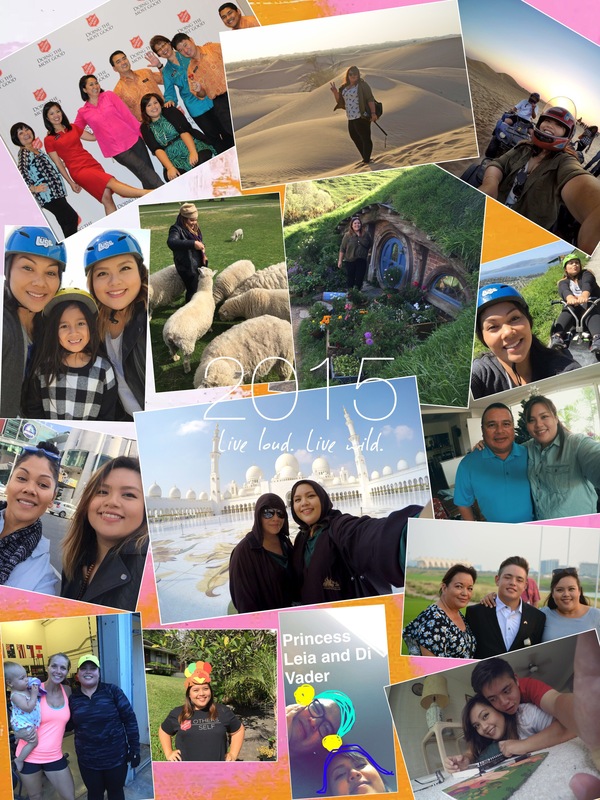 Among my many blessings, this year was THE YEAR TO TRAVEL. It started with surprising Abbey for her 30th, a couple work trips to Long Beach, CA and D.C. Then I took a first-time trip to Seattle to visit my cuzzies during the summer and visited Powell’s Books in Portland (checked that off my bucket list). Lastly, I embarked on a long awaited journey to New Zealand: land of the kiwis, epic meat pie producers of the world, Hobbit habitation land, the place to live pre-zombie apocalypse and the country I have dreamed of for years. Thanks to my friend Lani and Warren for traveling alongside me and taking me on a truly unforgettable trip. The last and final trip of 2015 was to Abu Dhabi for Brentt’s first amateur golf tournament. The only expectation I had was that it was going to be hot. Although I nearly fainted from the heat on the golf course, I was blown away by the kindness of the locals, the intricate and unconventional architecture and the food! Oh the food. Mmm…if there was a reason for you to pay me to get fat in Abu Dhabi…even New Zealand…I’d be so good, you best be quadrupling that salary! The final touch on 2015 was my mom, dad, and brother visiting me during the holidays. Mom came down during Thanksgiving, dad a couple weeks later and Brentt for Christmas. They all came down and filled my tummy and heart with happiness. I can’t ask for more. Exactly one year ago, I wrote down my resolutions for 2015. They were to face fears, drink more, enjoy life and be happy. I didn’t drink more, but I’ve accepted that I’m officially allergic to alcohol and it’s best if I just drink on occasion. My goal in 2016 is to love on those that need it (no matter how annoying they are), face fears (yes, again), lose weight (sadly same resolution, different year – but with a little progress), be grateful, pray more, read more, edit myself a little less when it comes to writing and be present. Like right now, I’m present mentally, physically, and spiritually in my element of typing at Starbucks and inhaling burnt coffee grinds listening to bad hipster music…all right before I head into work this morning. AMAZING babe! So proud and happy for you!! Love you!